Seeing that black and ladies are making their comeback this fall, I wanted to mention The Black Dahlia. I recently watched the 2006 film and was inspired by the fashion as well as the story – which is a gruesome tale of horror noir set in LA during the 1940’s. Hilary Swank’s character, like many woman of that time, copied Elizabeth Short’s look. There were also others, with less than noble personas that copied the way she was killed. Found on January 15, 1947 by a woman walking her 3-year-old child, Elizabeth’s body was mutilated and severed at the waist. Her face had been cut into a joker-like-grin and there were signs of sexual assault and torture all over the body. 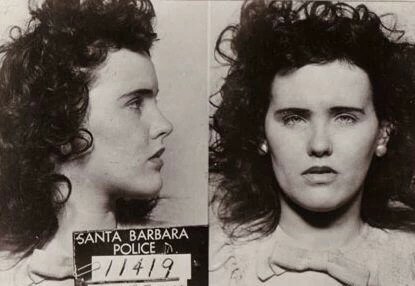 This horrific crime, even by today’s standards, gained national attention and made Elizabeth Short a superstar in all the wrong ways. After 60 years the story still remains embedded in today’s fashion, celebrity and culture. This entry was posted in Uncategorized and tagged Brian De Palma, Elizabeth Short, Hillary Swank, The Black Dahlia, The Black Dahlia murder, The Blue Dahlia. Bookmark the permalink.